ملکوتیان, محمد, گلپایگانی, عبدالعلی, رجبی زاده, احمد. (1394). بررسی کارایی فرایند نانوفیلتراسیون در حذف فلزات سنگین سرب، کادمیم، کروم شش ظرفیتی و مس از آبهای حاوی سولفات. مجله آب و فاضلاب, 25(5), 13-20. محمد ملکوتیان; عبدالعلی گلپایگانی; احمد رجبی زاده. "بررسی کارایی فرایند نانوفیلتراسیون در حذف فلزات سنگین سرب، کادمیم، کروم شش ظرفیتی و مس از آبهای حاوی سولفات". مجله آب و فاضلاب, 25, 5, 1394, 13-20. ملکوتیان, محمد, گلپایگانی, عبدالعلی, رجبی زاده, احمد. (1394). 'بررسی کارایی فرایند نانوفیلتراسیون در حذف فلزات سنگین سرب، کادمیم، کروم شش ظرفیتی و مس از آبهای حاوی سولفات', مجله آب و فاضلاب, 25(5), pp. 13-20. ملکوتیان, محمد, گلپایگانی, عبدالعلی, رجبی زاده, احمد. بررسی کارایی فرایند نانوفیلتراسیون در حذف فلزات سنگین سرب، کادمیم، کروم شش ظرفیتی و مس از آبهای حاوی سولفات. مجله آب و فاضلاب, 1394; 25(5): 13-20. فلزات سنگین از آلاینده‌های مهم محیط زیست است. هدف از این پژوهش بررسی کارایی غشای نانوفیلتر در حذف فلزات سنگین سرب، کادمیم، مس و کروم شش ظرفیتی از آب‌های حاوی سولفات بود.غشای استفاده شده از نوع NF، مدل حلزونی-مارپیچی و قطر اسمی حد برابر 27 دالتون، با جریان متقاطع و ظرفیت اسمی 8/0 لیتر بر دقیقه بود. 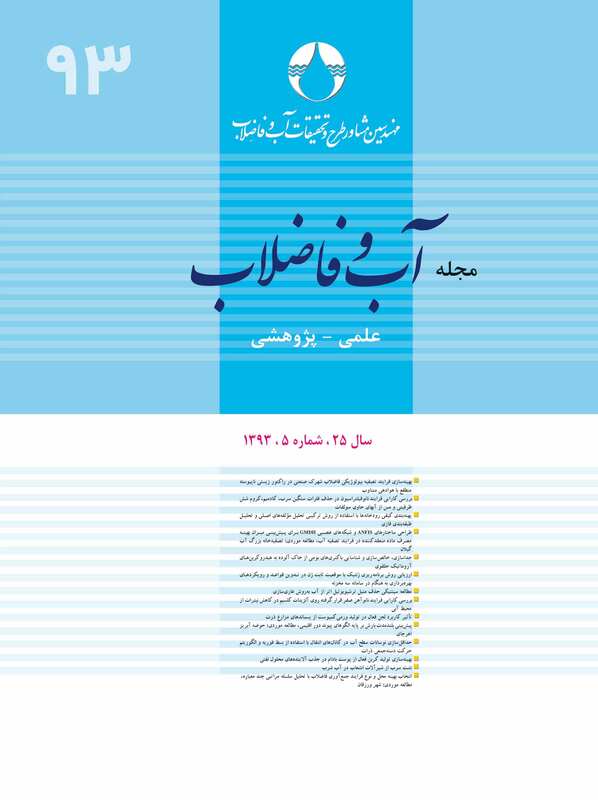 اثر متغیرهای غلظت اولیه فلز (دامنه 5تا 50 میلی‌گرم در لیتر برای سرب، کادمیم و مس و دامنه 1/0 تا 4/0 میلی‌گرم در لیتر برای کروم در 4 غلظت)، pH (9-4)، دبی عبوری (2/0، 4/0، 6/0 و 8/0 لیتر بر دقیقه) و غلظت آنیون سولفات (4 غلظت با دامنه 200 تا 800 میلی‌گرم در لیتر) بر کارایی فرایند در حذف فلزات بررسی شد. اندازه‌گیری با روش جذب اتمی و اسپکتروفوتومتری انجام شد.حداکثر راندمان حذف سرب،‌کادمیم، مس و کروم شش ظرفیتی در شرایط بهینه آزمایش به‌ترتیب برابر 91، 97، 98 و 95 درصد در نمونه‌های سنتتیک و 72، 53، 87 و 99 درصد در نمونه‌های واقعی بود. کارایی غشا در حذف سه فلز سرب، کادمیم و مس با افزایش pH و غلظت اولیه فلز نسبت معکوس داشت، اما در حذف کروم شش ظرفیتی،نسبت مستقیم بود. افزایش دبی تا میزان 6/0 لیتر بر دقیقه، افزایش نسبی کارایی غشا را در حذف هر چهار فلز به‌دنبال داشت.غشای NF، راندمان بالایی در حذف چهار فلز داشته و راندمان حذف در حضور یون‌های سولفات و افزایش دبی تا یک محدوده مشخص، به‌طور چشمگیری افزایش یافت. لذا می‌توان از این روش برای حذف آلاینده‌های ذکر شده استفاده نمود. Heavy metals have been identified as major pollutants and also as one of the most serious environmental hazards. The aim of this study was to evaluate the efficacy of NF membrane to remove the heavy metals Pb, Cd, Cu and Cr+6 from waters containing sulfate. The membrane used in this study was of the NF, spiral-wounded model with a MWCO equal to 27Da, a cross-flowed stream, and a nominal capacity of 0.8 L/min. The effects of the parameters initial metal concentration (within the range of 5 to 50 mg/L for Pb, Cd, and Cu and 0.1 to 0.4mg/L for Cr+6 at four different concentrations), pH (4-9), flow rate (0.2, 0.4, 0.6, and 0.8 mg/L), and sulfate anion concentration (four concentrations ranging from 200 to 800 mg/L) on heavy metal removal efficiency of the membrane were investigated. Measurements were performed using atomic absorption and spectrophotometry. The maximum removal rates of Pb, Cd, Cu and Cr+6 for synthetic samples under optimal experimental conditions were 91, 97, 98, and 95%, and those for real samples were 72, 53, 87, and 99%, respectively. It was observed that the membrane efficiency for removing the three metals of Pb, Cd, and Cu decreased with increasing pH and initial metal concentration while it increased in the case of Cr+6. Increasing flow to 0.6 L/min led to a slight increase in membrane removal efficiency for all the four metals. Based on the results obtained, NF membranes are capable of removing a high percentage of heavy metals and a significant increase is observed in their heavy metal removal efficiency in the presence of sulfate ions and with increasing flow up to a certain level. 1. Murthy, Z.V.P., and Chaudhari, L.B. (2008). “Application of nanofiltration for the rejection of nickel ions from aqueous solutions and estimation of membrane transport parameters.” J. of Hazardous Materials, 160(1), 70-77. 2. Ku, Y., Chen, S.W., and Wang, W.Y. (2005). “Effect of solution composition on the removal of copper ions by nanofiltration.” Separation and Purification Technology, 43(2), 135-142. 3. Kim, H., Baek, K., Lee, J., Iqbal, J., and Yang, J.W. (2006). “Comparison of separation methods of heavy metal from surfactant micellar solutions for the recovery of surfactant.” Desalination, 191(1-3), 186-192. 4. Fu, F., and Wang, Q. (2011). “Removal of heavy metal ions from wastewaters: A review.” J. of Environmental Management, 92(3), 407-418. 5. Casanovas Tardà, J., and Keiski, R. (2012). “Preconcentration of heavy metals by Donnan dialysis.” MSc. Thesis, University of Oulu, Barcelona. 6. Benatti, C.T., Tavares, C.R.G., and Lenzi, E. (2009). “Sulfate removal from waste chemicals by precipitation.” J. of Environmental Management, 90(1), 504-511. 7. Borden, R.K. (2003). “Environmental geochemistry of the bingham canyon porphyry copper deposit, Utah.” Environmental Geology, 43(7), 752-758. 9. Ritchie, S., and Bhattacharyya, D. (2002). “Membrane-based hybrid processes for high water recovery and selective inorganic pollutant separation.” J. of Hazardous Materials, 92(1), 21-32. 10. Muthukrishnan, M., and Guha, B. (2006). “Heavy metal separation by using surface modified nanofiltration membrane.” Desalination, 200(1-3), 351-353. 11.Wong, F.S., Qin, J.J, Wai, M., Lim, A., and Adiga, M. (2002). “A pilot study on a membrane process for the treatment and recycling of spent final rinse water from electroless plating.” Separation and Purification Technology, 29(1), 41-51. 12. Malakootian, M., Mahvi, A.H., Fatehizadeh, A., and Ehrampoosh, M.H. (2010). “Efficiency of calcium and magnesium removal by nanofiltration membrane from synthetic water under different operating conditions.” TOLOE-E-BEHDASHT, 9(4), 1-10. 14. Okhovat, A., and Mousavi, S.M. (2011). “Modeling of arsenic, chromium and cadmium removal by nanofiltration process using genetic programming.” Applied Soft Computing, 12(2),793-799. 15. Hongthong, P., Mattaraj, S., and Jiraratananon, R. (2010). “Fouling characteristics of natural organic matter and copper ion by nanofiltration.” The 8th Asian-PacificRegional Conference on Practical Environmental Technologies, Thiland. 16. Bouranene, S., Fievet, P., Szymczyk, A., El-hadi Samar, M., and Vidonne, A. (2008). “Influence of operating conditions on the rejection of cobalt and lead ions in aqueous solutions by a nanofiltration polyamide membrane.” J. of Membrane Science, 325(1), 150-157. 19. APHA. (2005). Standard method for examination of water and wastewater, 21st Ed., American Public Health Association Publication, Washington DC. 20. Afonso, M.D. (2006). “Surface charge on loose nanofiltration membranes.” Desalination, 191(1), 262-272. 21. Kang, M., Jeong, T.K., and Hwang, I.H. (2009). “Nitrate by nanofiltrations in very small drinking water systems.” World Appl. Sci. J., 5, 41-45. 22. Qdais, H.A., and Moussa, H. (2004). “Removal of heavy metals from wastewater by membrane processes: A comparative study.” Desalination, 164(2), 105-110. 23. Stasinakis, A.S., Thomaidis, N.S., and Lekkas, T.D. (2003). “Speciation of chromium in wastewater and sludge by extraction with liquid anion exchanger amberlite la-2 and electrothermal atomic absorption spectrometry.” Analytica Chimica Acta, 478(1), 119-127. 24. Ba, C. (2010). Design of advanced reverse osmosis and nanofiltration membranes for water purification [dissertation], Urbana-Champaign, University of Illinois. 25. Taleb-Ahmed, M., Taha, S., Maachi, R., and Dorange G. (2002). “The influence of physico-chemistry on the retention of chromium ions during nanofiltration.” Desalination, 145(1), 103-108. 26. Yao, P. (2010). The removal of heavy metal pollutants with electrowinning techniques [dissertation], Rhode Island, Brown University. 27. Causserand, C., Aimar, P., Cravedi, J., and Singlande, E. (2005). “Dichloroaniline retention by nanofiltration membranes.” WaterResearch, 39(8), 1594-1600. 28. Anim-Mensah, A.R., Krantz, W.B., and Govind, R. (2008). “Studies on polymeric nanofiltration-based water softening and the effect of anion properties on the softening process.” European Polymer Journal, 44(7), 2244-2252. 29. Liu, F., Zhang, G., Meng, Q., and Zhang, H. (2008). “Performance of nanofiltration and reverse osmosis membranes in metal effluent treatment.” Chinese Journal of Chemical Engineering, 16(3), 441-445.